Why is it important that John teaches Jesus = The Word/ is God? Why is this important for us now? In relation the physical world, what are we? What is significance of “true light?” Response? In relation to the moral (darkness) world what are we? Response? How is Jesus the hope of humanity? In relation to the lost, what are we? In what visible ways did Jesus reflect the Father? Are we to do the same? How can we do this? Becoming a “child of God” involves what? (One word in vs. 13). With whom and where does Jesus elaborate on this? This is the heart of John’s Gospel. “Truth” = Embodiment/ Communicator of/ truth which makes people free. In a world where Pilate’s question, “What is truth?” why is Jesus so important? What is the significance of “Law/Moses” and “grace/truth by Jesus”? Why do you think so much is said about John the baptizer? It is truly a marvelous thought that “.. the Word became flesh and dwelt among us, and we beheld his glory, glory as of the only begotten from the Father, full of grace and truth.” God (the Son) came to this earth, lived and died according to the plan and design of God to save mankind. His very life shows us how grace and truth find balance and application in life as opposed to a life based on law and works. The point which John writes to prove is that this is THE ONE mankind has long been waiting for… the Son of God! True there are other things he could have written about… but this subject is the supreme need of man. Jesus is the embodiment of “Reason” and “Creating power”, our salvation… Jesus is truly amazing, and as John records in Revelation 4:12-14 “WORTHY IS THE LAMB”. Jesus is the embodiment of grace and truth. (In other words… He, what He says, and does… His example, His deeds are both grace and truth in action. Jesus didn’t just talk… HE LIVED. Grace (unmerited favor) in action in how he deals with people in their sin, in their hurt and pain. Today we understand the meaning of grace, and yet we seem to come up short in how to apply grace. Our focus on truth is not wrong. We need truth… but our lack in understanding and having the balance of grace has hurt us. Jesus, John says, is “full of grace and truth”. Jesus said in John 14:6 “I am the way, the truth and the life; no one comes to the Father but through Me.” The way is clear, and there is only one way… it is Jesus. We have a hard time understanding and putting our arms around GOD… but Jesus is the ‘door’ to the Father, and we can wrap our arms around Jesus, because He was one of us. Finally mankind can find the peace that passes all understanding, the forgiveness of not just a few minor sins, but all sins… all because of this ONE man… Jesus. Following the idea of “truth”… Jesus was the divine ‘Communicator’ of truth. John 8:31-32, “If you abide in My word, then you are truly disciples of mine, and you shall know the truth, and the truth SHALL MAKE YOU FREE.” Free from what? Free from the power, the principle and the punishment of sin (Romans 8). “…Everyone who is of the truth hears my voice” (John 18:37b). The Spirit of truth also is with us today, (John 14:17)… this is not to say we receive revelations… because we have the Word of God, but this same Spirit is the One Jesus referred to in John 3:3-5 and 7:37-39, as being the One who takes part in our own new birth (more on that when we study John 3 and 7). Truth can be resented and resisted…(John 8:40; Acts 7:51-55). It can be rejected and disbelieved (John 8:45). Yet it’s power, when seen in the only begotten Son of God… cannot be disputed (Philippians 2:5-11), the Suffering Servant prophesied by Isaiah 53. Next: Jesus! The Inexaustible, Revealing, Lamb of God! I. THE PROPHET SPEAKS AGAIN! (From Malachi to John the baptizer, a period of some 400 years has passed. The silence of ‘prophetic speaking’ should not assume the absence of Divine work. God has not nor will He ever retire or take a ‘Sabbatical’. The prophecy of Daniel 2 is being fulfilled, the Romans are in power, Israel hates them, and longs for a special someone to come and free them from their rule, and restore once more, the former glory of Israel. What Israel hopes for will not happen,because God’s plan is greater. It will take the form of a witness named John, who will ‘prepare the way’ for the Savior named Jesus. John lived, and preached in the wilderness, knowing all along, that he would be eclipsed by the Promised One. He, unlike many, had no problem with ‘playing second fiddle’, His ministry, although great, and although he immersed many, would ‘decrease’ while that of the Messiah would ‘increase’. Of course this is how it should be since John was not the Christ. Note what John says, “He (John the baptizer) did not fail to confess, but confessed freely, “I am not the Messiah.” 21 They asked him, “Then who are you? Are you Elijah?” He said, “I am not.” “Are you the Prophet?” He answered, “No.” 22 Finally they said, “Who are you? Give us an answer to take back to those who sent us. What do you say about yourself?” 23 John replied in the words of Isaiah the prophet, “I am the voice of one calling in the wilderness, ‘Make straight the way for the Lord.’ ” (John 1:20-23).Preparing the way for the Messiah, meant he would be preparing the hearts of those who would repent and be immersed, for the coming kingdom (rule) of the Messiah. These were to the rulership of this Messiah. John’s was but a preamble for something, Someone greater. 1. John was “NOT the Light”, but came to bear witness of the Light”. (John 1:8). 3. John had fewer disciples than Jesus, (John 4:1). 4. John was a prophet of God, but Jesus was the miracle worker, of which he spoke (John 10:41-42). 1. The FATHER: John 8:18. 2. JESUS: John 8:14, 18. 4. The (OLD TESTAMENT) SCRIPTURES: John 5:39, 46; John 1:45. 5. The DISCIPLES John 15:27; John 19:35; John 21:24; I John 1:1-2. “In him was life, and that life was the light of all mankind. 5 The light shines in the darkness, and the darkness has not overcome it” (John 1:4-5).”The true light that gives light to everyone was coming into the world” (John 1:9). Truly marvelous verses about Jesus with whom, there are NO DOUBTS, NO DISPARE, NO DARKNESS OF DEATH, and true victory OVER SIN. “UNRECOGNIZED” “He was in the world, and though the world was made through him, the world did not recognize him. 11 He came to that which was his own, but his own did not receive him” (John 1:10-11). Notice what Paul says in Romans 1:16-17, 21-25. How can the world NOT SEE the greatness of God? Yet it is to be expected. They ‘hated’ Him, and they will hate all who follow Him. Let us…. “LOOK OUTWARD” – Planets, ‘keep to their appointed course’. Tides of the oceans, ‘keep their appointed times’. Then you have seed time and harvest time. Spring, summer, fall and winter, all follow as planned. That there is a Supreme Scientist, a Designer, is proclaimed to all mankind through Creation. Mankind may not know the True God, or His plan, or the Messiah through creation, but they know there is SOMEONE. “LOOK UPWARD” – The stars are as many as the sands on the shore, and more. Astronomy shows that there is a Controller of it all. Consider Psalm 139 and Psalm 19. “LOOK INWARD” At the amazing make up of man and woman. Even without a ‘written law’ man still has a knowledge of what’s right and wrong, (Romans 2:14-15). Yet there is still within mankind, an emptiness, and a ‘hole’ which none can fill but a relationship with the Creator (Ephesians 2:5-11; Psalm 23). “CHILDREN OF GOD” – “Yet to all who did receive him, to those who believed in his name, he gave the right to become children of God— 13 children born not of natural descent, nor of human decision or a husband’s will, but born of God.14 the Word became flesh and made his dwelling among us. We have seen his glory, the glory of the one and only Son, who came from the Father, full of grace and truth” (John 1:12-14). This is the desire, plan, goal of God… to ‘redeem’, by back, all who would come to Him through His Son, Jesus. He offers grace in Jesus Christ, to all who will come..
John 6:44-45; John 5:39-40; John 3:3-7, 16; John 20:30-31; Matthew 28:18-20; Mark 16:15-16; Acts 2:37-39. We introduce this lesson with some excerpts from William Barclay’s Devotional on John, “Before we begin to study (John) in detail, let us try to see what John was trying to do when he wrote it…… Christianity began amongst the Jews; and therefore inevitably it spoke in the Jewish language and used Jewish categories of thought. But although Christianity in Judaism it very soon went out into the wider world. Within thirty years of Jesus death, by AD 60, Christianity had traveled all over Asia Minor and Greece and had arrived in Rome. By AD 60 there must have been a hundred thousand Greeks in the Church for every Jew who was a Christian. Jewish ideas were completely strange to the Greeks. To take but one outstanding example, the Greeks had never heard of a Messiah. The very center of Jewish expectation, the coming of the Messiah, was an idea that was quite alien to the Greeks. The very category in which the Jewish Christians conceived and presented Jesus, meant nothing to the Greek. Here then was the problem – how was Christianity to be presented to the Greek world?…. As E. J. Goodspeed put it, the question was, “Must a Greek who was interested in Christianity be routed through Jewish Messianic ideas and through Jewish ways of thinking, or could some new approach be found which would speak out of his background to his mind and heart?”…. Round about the year AD 100 there was a man in Ephesus who was fascinated by that problem. His name was John. He lived in a Greek city. He dealt with Greeks to whom Jewish ideas were strange and unintelligible and even uncouth. How could he find a way to present Christianity to these Greeks in their own thought and in their own language and in a way that they would welcome and understand? Suddenly the solution of the problem flashed upon him. In both Greek and Jewish thought there existed the concept of ‘THE WORD’. Here was something which could be worked out to meet the double world of Greek and Jew. Here was something which belonged to the heritage of both races, something that both could understand.” (William Barclay’s ‘Gospel of John’, Vol. 1 Pgs 2-3). Jesus is referred to as the ‘Good Shepherd’ , ‘Lord’, ‘Mighty God’, ‘Prince of Peace’, ‘the way, the truth, and the life’, ‘Light’, ‘first and last’, ‘Alpha and Omega’, ‘Lamb of God’, and ‘Savior’. John introduces him as the “Word”. John’s purpose in writing, is “that all might believe” (John 20:30-31), in Christ, the answer to man’s sin predicament, (John 3:16). I. 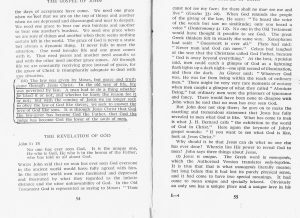 “IN THE BEGINNING WAS THE WORD”: “In the beginning God created…. (Genesis 1-2:2), John says that “the Word” was there. More than just ‘being there”, we find that He created the worlds (universe) (Hebrews 1:1-3). A. Since the Word was “before” all things (creation) – He is therefore eternal. B. John records Jesus as saying, “Verily, verily, I say unto you, Before Abraham was, I am” (John 8:58). When Jesus said this, the Jews understood him to be making the claim to Deity, (cf. Exodus 3:19). C. “In the beginning was the Word, and the Word was with God, and the Word was God” (John 1:1) is a profound way to begin, and in doing so, he portrays Jesus as the very “reflection of God” for all to see, believe in, and follow. D. God did not change! (Just as the Word of god does not change… it like Jesus… is meant to CHANGE US)… Our knowledge of God changed when Jesus came. Jesus said, “If you really know me, you will know my Father as well. From now on, you do know him and have seen him.” 8 Philip said, “Lord, show us the Father and that will be enough for us.” 9 Jesus answered: “Don’t you know me, Philip, even after I have been among you such a long time? Anyone who has seen me has seen the Father. How can you say, ‘Show us the Father’? 10 Don’t you believe that I am in the Father, and that the Father is in me? The words I say to you I do not speak on my own authority. Rather, it is the Father, living in me, who is doing his work” (John 14:7-10). E. Paul said, 11 When I was a child, I talked like a child, I thought like a child, I reasoned like a child. When I became a man, I put the ways of childhood behind me. 12 For now we see only a reflection as in a mirror; then we shall see face to face. Now I know in part; then I shall know fully, even as I am fully known (I Corinthians 13:11-12). The idea being that there are some spiritual things we just can’t clearly see, whereas later we will see clearly. We don’t understand everything about God, and Jesus revealed the Father, but even still, after this life is over, Christians will truly see God. Jesus shows us the Father, in love, character, patience, caring, saving, reaching out to mankind, giving, and much more. This does not compare to what we will see later. Paul said 4″ For everything that was written in the past was written to teach us, so that through the endurance taught in the Scriptures and the encouragement they provide we might have hope” (Romans 15:4). In the Old Testament one is constantly faced with fields of battle, blood shed, sacrifices, plagues etc… one child was asked about this, and he said, “O that was before God became a Christian.” No there are not two separate Gods, there is One God (Deuteronomy 6:4). The Old Testament does not portray God one way and the New Testament another way. Jesus reveals what God ‘was’ and ‘is’ and ‘always’ will be. John says, 2″ He was with God in the beginning.” (John 1:2). All that Jesus ‘was’ God is. His desires, love, justice, jealousy, feelings and grace are all revealed both in the Old and New Testaments. Jesus (the Word made flesh) came, and showed the same, but he especially came to die on the cross for us (Philippians 2:1-11). Compare what Peter says here, 4″ For if God did not spare angels when they sinned, but sent them to hell,[a] putting them in chains of darkness to be held for judgment;” (2 Peter 2:4) and “9 The Lord is not slow in keeping his promise, as some understand slowness. Instead he is patient with you, not wanting anyone to perish, but everyone to come to repentance. (2 Peter 3:9). Same Lord and Savior revealed in both. 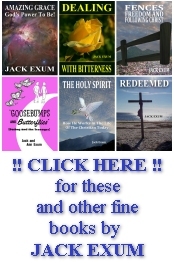 The New Testament has always affirmed – GOD created something out of nothing. Read John 1:3 3 “Through him all things were made; without him nothing was made that has been made.” The writer of Hebrews says, “Now faith is confidence in what we hope for and assurance about what we do not see. 2 This is what the ancients were commended for.” (Hebrews 11:1-2). Do we understand HOW God created everything? No! Can we explain how everything was made? No! Do we believe God made everything mentioned in Genesis 1-2? Yes! This is called faith. Evolution is nothing more than a theory, which is unprovable, and takes more faith to believe in. It has no place in the Genesis record. (An excellent exposition and discussion of this is Gerald Wright’s work on “The Supreme Scientist” which can be obtained through his site at Biblical-Books.com. This link is found on jackexum.com for easy access. John records these wonderful words, “In him was life, and that life was the light of all mankind.” (John 1:4). When I was a young child, I was afraid of the dark. I would cry out to mom or dad, and they would come and turn on the light, or bring a light. It lit up the room, and dispelled the darkness. Going through life without Jesus is like walking in darkness. Jesus came and ‘lit up the whole world’. I know of no other who can do this? “He is my everything, He is my all”. Why would anyone turn away from Him? John 5:40 “yet you refuse to come to me to have life. Studying the Scriptures you will come across words and phrases used in special ways to represent certain lessons. These are not difficult, and john is no exception to this. He writes to the Greek mind in ways which appeal to them, and they can easily understand. The use of LIGHT AND DARKNESS as representing GOOD AND EVIL respectively was a s common then as it is now. Simply put, Jesus is the light of the world. Satan is the ruler of darkness. Due to the Religious leaders of Jesus’ time, (Pharisees, Sadducees etc…) the people of God (Israel) could have no close relationship with God their Father. Jesus often exposed their hypocrisy, and ignored their traditions and ‘laws’ which stood as ‘road blocks’ to walking with God. When Jesus spoke (cf. Matthew 5-7) it was like putting a light in a pitch black room. He spoke “as no one else did” with the authority of God. It was a time of darkness, and sin. Jesus came as the true light of the souls of mankind.